The official English Grammar in Use app, written by Raymond Murphy. The only grammar app an intermediate learner of English will ever need. The official English Grammar in Use app, written by Raymond Murphy. The only grammar app an intermediate learner of English will ever need. This Starter Pack includes six grammar units (Present and Past tenses) with clear explanations and interactive exercises, a Glossary of grammar words, and a Study Guide to help you decide which grammar units you need to study. 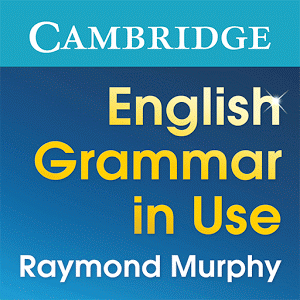 • Raymond Murphy’s English Grammar in Use is the world’s best-selling grammar book for intermediate learners of English, published by Cambridge University Press. The app contains clear presentation of grammar points together with interactive exercises to help you practise and improve. After downloading the Starter Pack you can buy all 145 grammar units or just the units you need. • The grammar explanations and exercises have been written by Raymond Murphy specially for smartphones and tablets, making it easier to study grammar anytime, anywhere. • Answers to the grammar activities are marked automatically and allow you to reveal the correct answer when you make a mistake. Perfect for self-study. • Audio recordings of the example sentences help you to improve your listening skills, at the same time as improving your grammar. • Download the Starter Pack now and start improving your English grammar today! Cambridge University Press is a world-leading publisher of English language learning materials. Expert authors write all of the content in our apps.